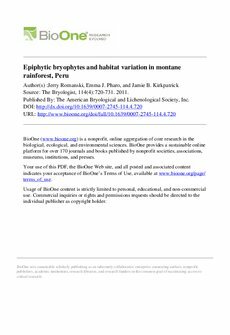 Copyright 2011 The American Bryological and Lichenological Society, Inc.
A survey of epiphytic bryophytes within a tree was conducted in lower montane rainforest at 2400 m in the Peruvian Yungas. The Weinmannia sp. host tree supported 110 species (77 hepatics, one hornwort and 32 mosses). To our knowledge, this is the highest single-tree bryophyte species richness reported to date. We used Johansson zones (lower trunk, upper trunk, mid-crown, mid-outer crown and outer crown) to stratify our sampling and found that the greatest species richness and abundance was on the upper trunk and large branches of the mid-crown. Hepatics, and the Lejeuneaceae in particular, were dominant in all five Johansson zones of the tree. The mid-crown had higher radiation intensity than the dark lower trunk while still having high relative humidity. Non-metric multidimensional scaling indicated the presence of four communities: an outer crown, a mid to mid-outer crown, an upper trunk and a lower trunk community. The outer crown supported only two moss species along with 35 hepatics, which included 17 high-light tolerant hepatics. The climate data suggested that this pattern was due to higher irradiation and exposure. More bryological work is needed in these poorly catalogued montane forests of the Peruvian Andes, which are under multiple threats that include forest clearing and climate change.